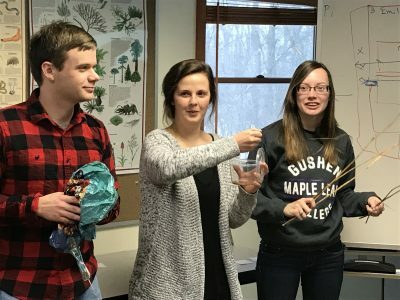 Students in Merry Lea’s Master’s in Environmental Education program discuss vexing social problems in their Environmental Issues and History class. They prepare presentations on topics like micro-plastics and nuclear disasters. All the same, students say they find hope in the course. James Austin, Emily Hayne and Delanie Bruce assist a classmate’s presentation by providing sound effects. Dr. Joel Pontius, who teaches the course, stresses workable solutions on multiple scales. He enjoys crafting field trips that feature people who are solving environmental problems at all levels, from the household to businesses, from NGOs to government offices. For Joel, it doesn’t get much better than visiting the Warkentien home in Mishawaka where electricity, heating and transportation all run on sunshine. Its owners, Dave and Vicky Warkentien, redesigned the home based on passive house principles so that it requires a fraction of the electricity most houses its size would use. The large bank of rooftop solar panels also supplies the Warkentiens’ electric cars. 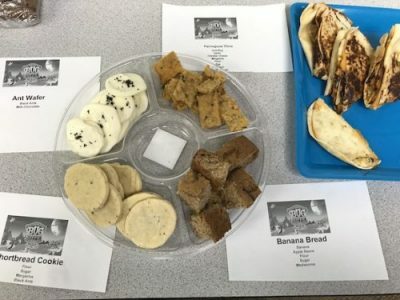 TJ Rayhill’s snacks made with insect protein illustrate his research into one solution to food insecurity. “Actions like these can normalize such lifestyle decisions. When enough people are involved, it can lead to shifts at the policy level,” Joel observes. Sarah Gothe, LaPorte, Ind., who graduated from Goshen College in 2013, was inspired by the class visit to her alma mater. Students met with Director of Facilities Glen Gilbert and also learned about the college’s efforts to renew its STARS rating. The Sustainability Tracking, Assessment and Rating System is a national benchmark for campuses developed by the Association for the Advancement of Sustainability in Higher Education. Goshen College was a charter member in 2011 and earned a silver STARS rating in 2013. Gothe was impressed by the fact that gymnasium in the college’s Recreation-Fitness Center is cooled with giant fans, not air conditioning. Staff automate the fans based on occupancy and temperature needs and also control lighting based on usage. Delanie Bruce, Snyder, Neb., found the field trip to the Indiana-Michigan Power Company in Fort Wayne particularly hopeful. “They told us that by 2030, all of their coal-fired power plants will be decommissioned because there are less expensive sources of energy: renewable energy, nuclear power and natural gas,” she said. Renewable energy is more cost-effective than nuclear power because of the high cost of building nuclear plants. Students researched solutions to environmental problems as well. 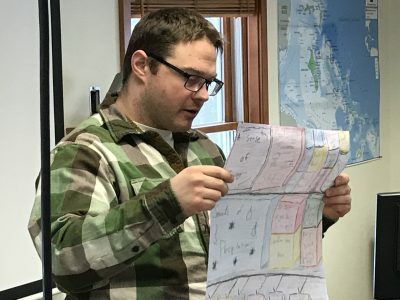 Josh Crawford, a former teacher from Brighton, Mich., was encouraged by what he learned while studying urban heat islands. The concrete buildings and impermeable surfaces that dominate cities can raise temperatures from three to ten degrees above the temperature of nearby rural areas. One solution is to invest in urban forestry. Trees not only absorb solar radiation and provide shade; they also absorb stormwater, preventing run-off. Josh says that Washington, D.C., with nearly two million trees, is a leader in this area. T.J. Rayhill, Mt Washington, Ky., took a novel approach to the problem of food insecurity. “You can grow enough insects in four square feet to provide all the protein a family would need!” he exclaims. While this diet would be a stretch for most North Americans, insects are a valuable food source in many cultures. Rayhill bought crickets, ants and mealworms from a company that farms them and treated his classmates to insect snacks. Josh Crawford uses a map to describe time spent outdoors reflecting. Even with a positive spin on environmental issues, Joel agrees that the course is “a lot to process.” Therefore, students complete one more assignment: claiming a “sit spot” outdoors. They are asked to spend a half an hour there for 20 days at many different times of day and night, in all sorts of weather. The sit spots provide a way to wrestle with material that is hard to understand and difficult to think about. The exercise also makes reflective space for students mid-way through their masters program. At the end of the course, students present a creative project that represents what they have learned in their sit spots. Students have written children’s books, composed music, painted, sketched, written poetry, taken photos, and more. In these everyday interactions with places around Merry Lea, students orient themselves to the wonder and complex beauty of the land in winter, oftentimes finding hope in the simple act of paying attention.